West, Ian. 2013. 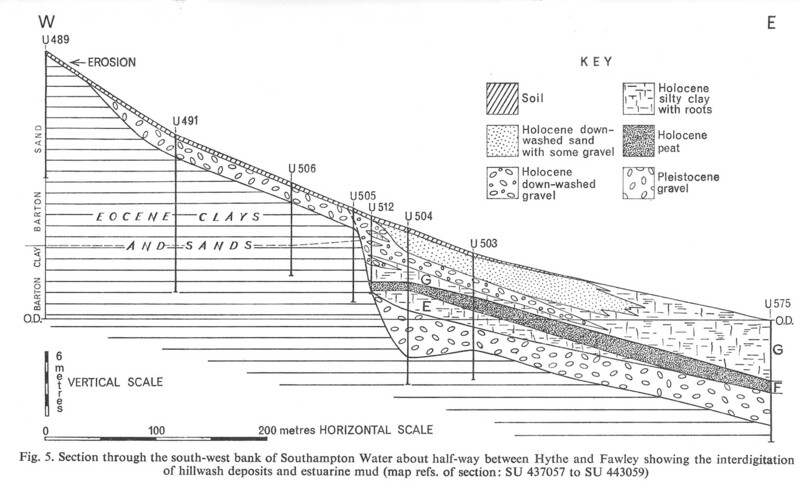 Geology of Fawley Power Station Excavations, Southampton Water, Solent, with a contribution on the Neolithic peat by A. Murray. http://www.southampton.ac.uk/~imw/Fawley-Power-Station-geology.htm. Version: 15th December 2013. Paper - Hodson, F. and West, I.M. 1972. 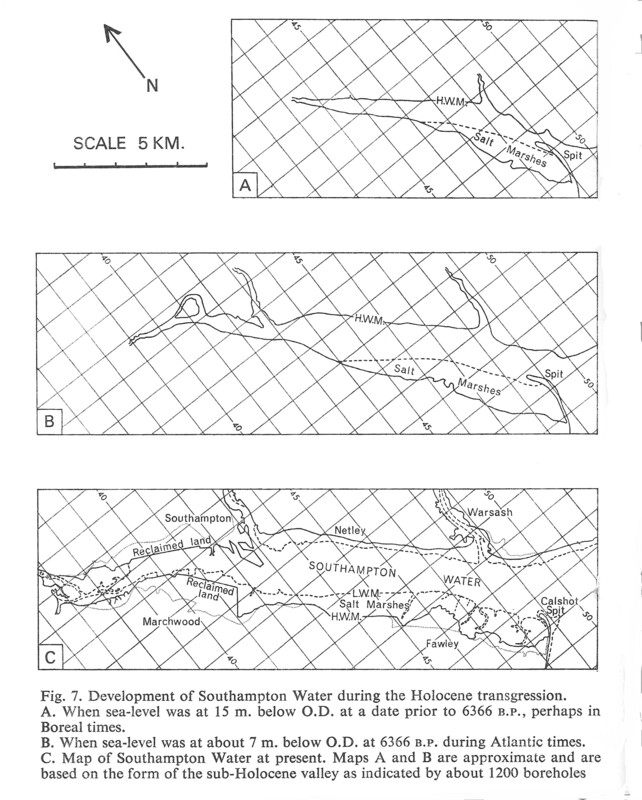 Holocene Deposits of Fawley, Hampshire, and the Development of Southampton Water. Proceedings of the Geologists' Association, vol. 83, part 4, pp. 421-442. Fawley Power Station is a large oil-fired power station, built on the southwestern shore of Southampton Water in 1964 and 1965. 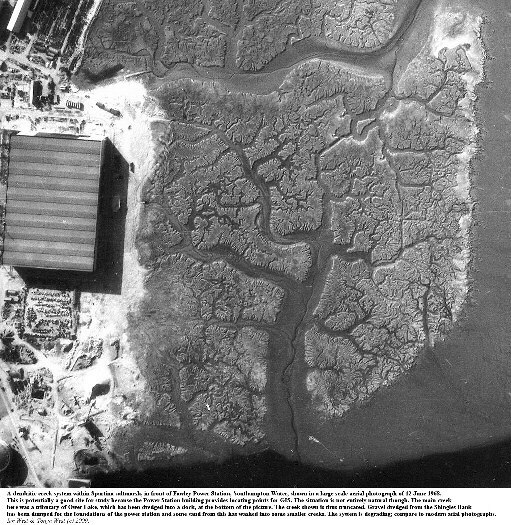 As shown on the old aerial photograph above, this is has been an area of accumulation of estuarine mud and extensive development of saltmarshes. Unfortunately these marshes are now in decline from frontal erosion, creek-widening and die back of Spartina. 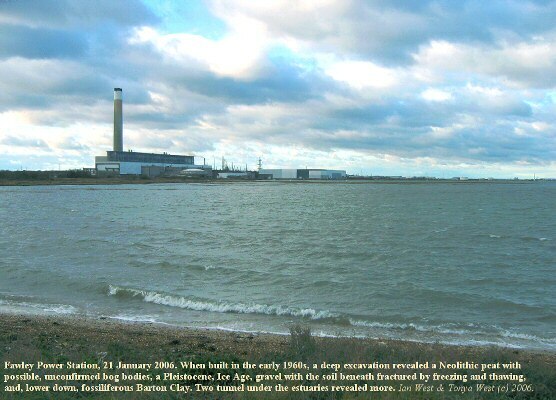 The excavations for Fawley Power Station provided valuable information on the geology of the Eocene strata which underlies the area, on the sheets of Pleistocene gravel here below sea-level and on the Holocene mud and peat. A tunnel beneath Southampton Water from the power station to Chilling on the opposite bank provided much geological data. 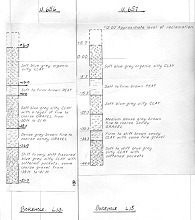 Numerous boreholes were associated with both the power station site and with the tunnel so that it was possible to obtain much detail on strata that are poorly exposed at the surface in the area. 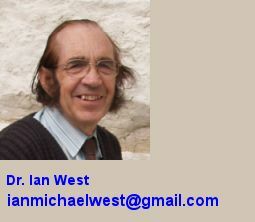 Ian West was involved with the geological interpretation at the time and co-authored some papers on the geology of the area. Top left photograph: Fawley Power Station is built on the marshes on the up-estuary side of Calshot Spit. It is seen here in an oblique view across the spit, looking in a generally northwestly direction. Conveniently fixing the position is the old red-brick officers' mess of the former RAF camp at Calshot Spit. Further back and just in front of the power station is the white-roofed, dome-like, control building. When the photograph was taken the tide was very low; the level of the Neolithic peat bog would have been a metre or so lower than this. The normal southeastern shoreline of the spit at that time would have been out here where the photograph was taken or even further south. 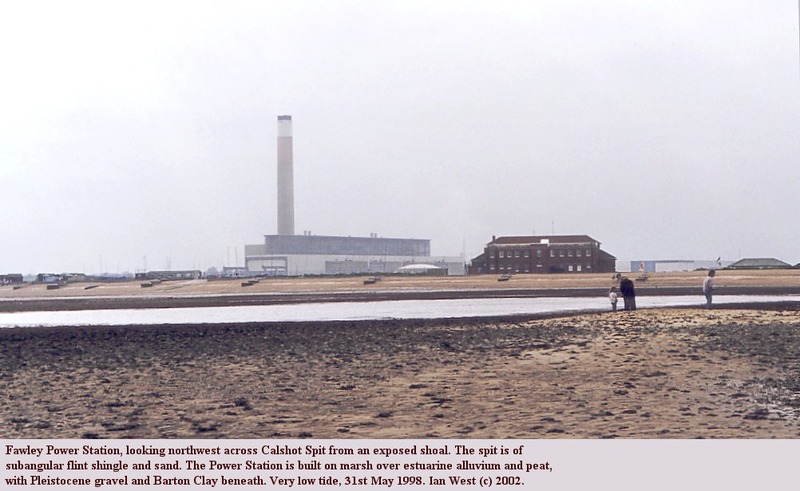 The spit is known from boreholes to have been present in Neolithic times (Hodson and West, 1972). 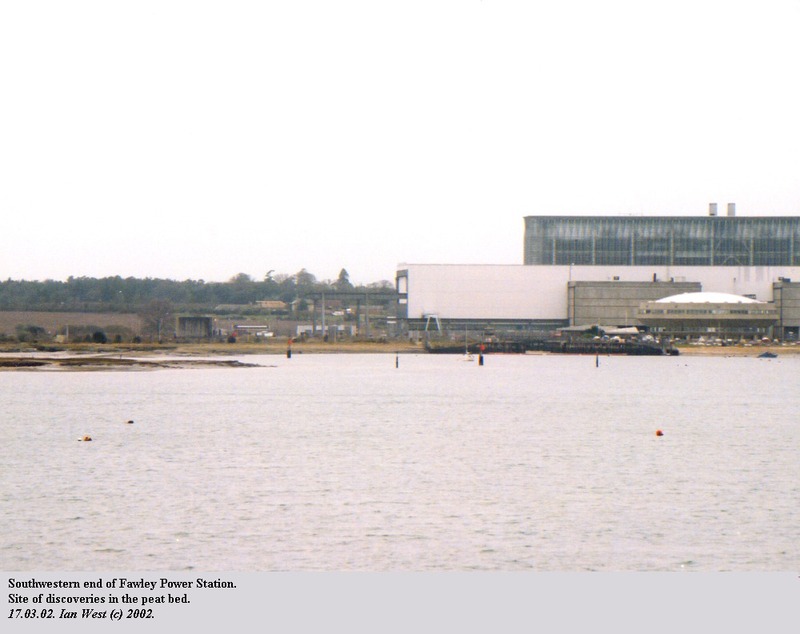 Top centre photograph: Fawley Power Station with Ower Lake in front, as seen from Southampton Water. The Ower Lake area has been dredged for ship access to the Power Station. Small boats still anchor in the area of the mouth of Ower Lake. Top right photograph: The southwestern end of the Power Station where the objects, that seemed to be bodies, were found. Here a dredged dock now exists on the site of the landward part of Ower Lake. Bottom left image - map: The Fawley Power Station site was investigated by numerous boreholes in 1964. The location of some of these and of the building is shown on this map, together with what is believed to be the former location of the possible bog bodies. Note the former shape of Ower Lake. 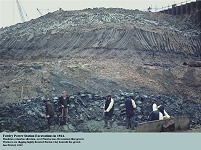 Bottom right photograph: The excavations for the foundations of the power station are shown here, as observed by Ian West in 1964. The peat bed is black with much reed and woody material. It stands up more firmly that the bluish grey greasy clay. The latter has a high organic content and with abundant diatoms may be so plastic because of a content of diatom mucus. Coccoliths also occur in this. Look at the photograph and appreciate that this was a very muddy and a very noisy site with various machines working and drilling. Notice the absence of safety helmets. There was a smell of earthy muds, cement and diesel fuel; there was a definate danger from the machines and the hooks of the large cranes which swung across the area. 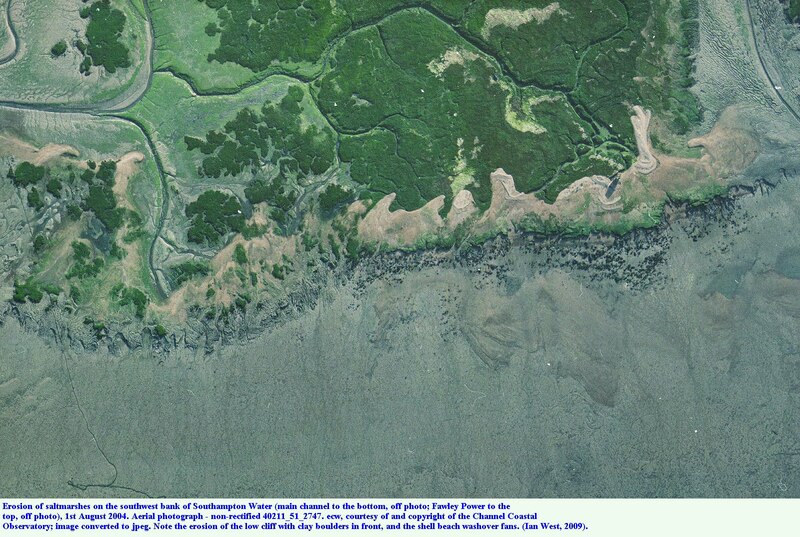 See also photograph given above; see also the saltmarsh section in webpage: Calshot Spit and Stanswood Bay. 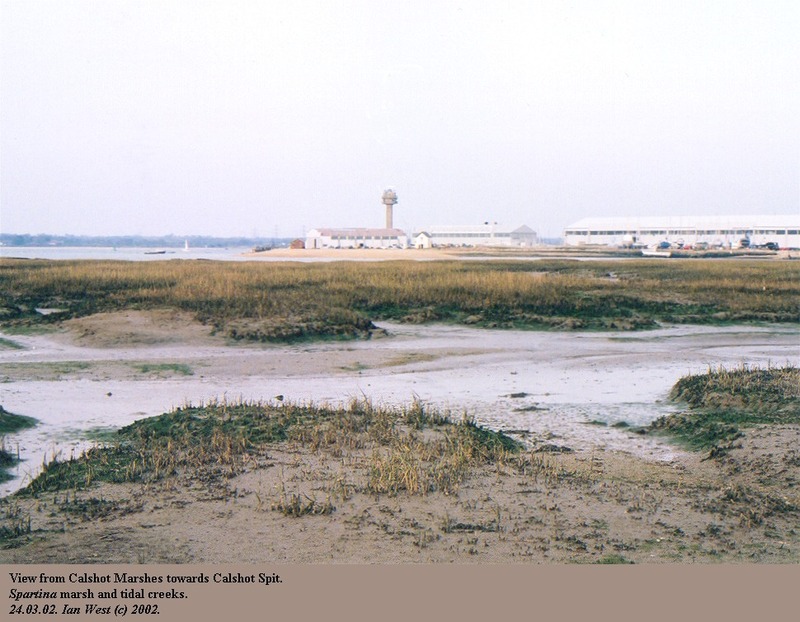 The Spartina saltmarshes in front of Fawley Power Station were already showing degradation in 1968, as shown in a photograph above. However a dendritic system still existed, although with some widening of creeks and the artificial truncation of the system by the dredging of the dock on the site of the ancient Ower Lake (creek). By 6th May 2001 there had been extensive frontal retreat in the Ower Lake (southeastern) area. The edge of the main channel had also reatreated with the distinctive Cerastoderma shell cheniers (white shell beaches) transgressing landwards. These shell accumulations are produced by wave action eroding the mudflats and washing out the Cerastoderma shells. The waves then transport these landward to shell banks against or over low cliffs at the edge of the saltmarsh. Examine the lower photograph carefully. There are many interesting aspects. Look at the creek system. Notice just how extensive the erosion has been in 33 years. The saltmarsh at Fawley Power Station might not survive another 33 years. Look also at the details. Enteromorpha, green filamentous algae, covers much of the mudflats of the widened creeks near the Power Station. A little further northwest, up the estuary the next creek shows less Enteromorpha. Why is this? Is Enteromorpha development favoured near the Power Station because of increased freshwater run-off or is there some other reason. Notice, also, there are some small dark patches of Fucus, seaweed, within the creek system. 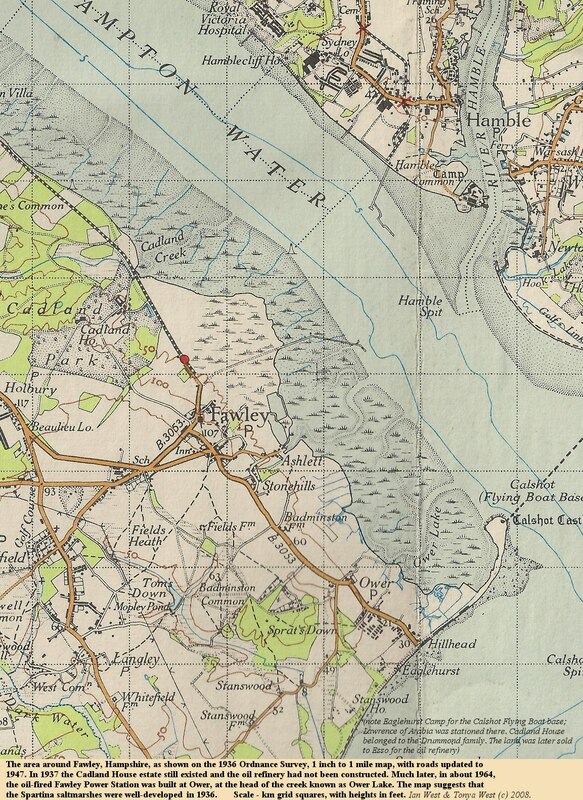 At the front of the marsh near the main channel of Southampton Water there has been serious retreat. The extent of the erosion is obvious on the aerial photograph by the numerous fallen blocks of silt in front of the low cliff. Landward of this edge the cheniers in some cases have been driven landward over a part of the saltmarsh. Above, is another image of washover fans of shell debris onto the degrading Spartina saltmarshes in front of Fawley Power Station. This photograph is from 1st August 2008, and is courtesy of the Channel Coastal Observatory. The washover fans are often lobe-shaped. Notice that they are above a low cliff (of about a metre high) of organic-rich saltmarsh clay (although pelleted into silt particle-size. Again, there are fallen blocks or boulders of this marsh clay. 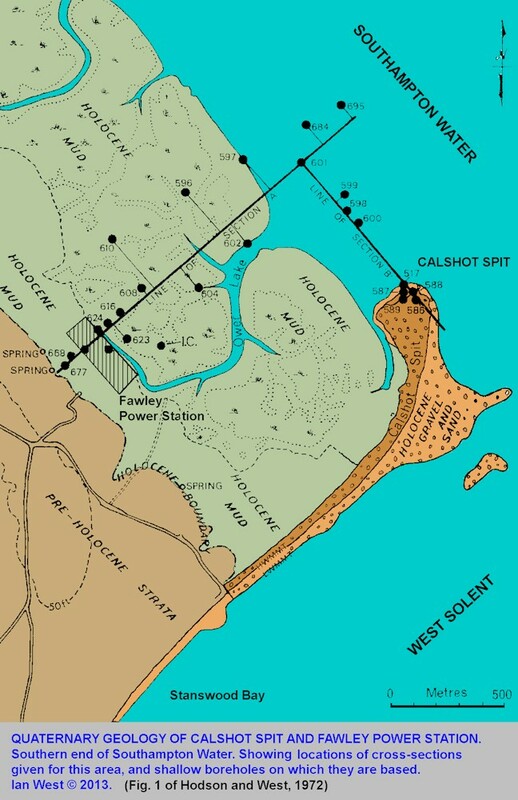 The sequence at Fawley Power Station consists of the Eocene Barton Clay overlain by Pleistocene, periglacial, river gravel, and this in turn is followed by estuarine alluvium (mud) with a bed of peat. The Power Station is founded in the Barton Clay which here is much fissured as a result of freezing and thawing in the periglacial conditions of the late Pleistocene (Devensian). The fissures become closer as the gravel is approached. 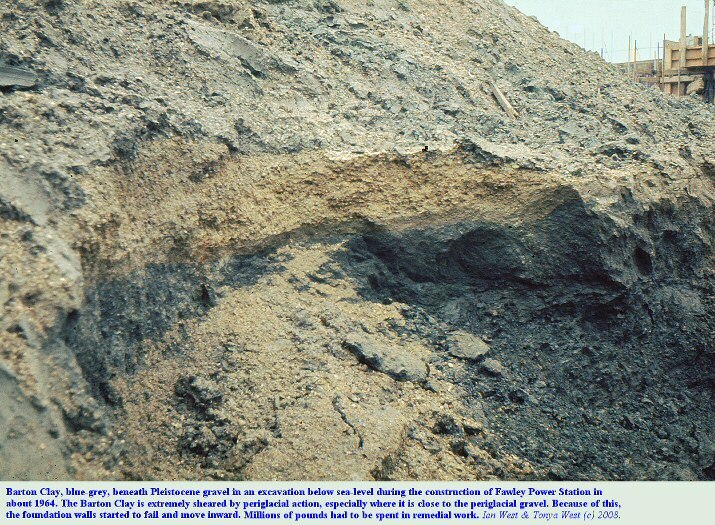 Civil Engineering problems with the foundations resulted from a misunderstanding of the fissured nature of the clay. Its geotechnical properties interpreted from a block within several fissures were very different from those interpreted from clay including fissures. The fissures so weakened the clay that the walls around the foundation excavation began to show movement in. As a result the foundations were greatly stengthened with much additional concrete. Mr Dunn has correctly made reference to this major remedial work. The Pleistocene gravel above the clay descends in a series of terraces towards Southampton Water. Its deepest level near Calshot Spit is at about 21m below OD. In the Solent the old river valley of the Solent River descends southeast around the Isle of Wight dropping to more than 40m. The old channel then swings southwest to join the submerged channel of the extended River Seine off Le Havre. The Fawley Power Station site is on the edges of two terraces. Above the gravel is an ancient soil of about 10,000 years old or less. Estuarine alluvium follows. This is soft, sticky, blue-grey mud with marsh plant roots at certain horizons and estuarine molluscs like the burrowing bivalve Scrobicularia and the small gastropod Hydrobia. As shown in the diagram dates of more than 6,000 BP have been established some way down in this by Churchill (1966). 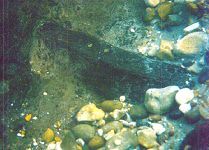 In the upper part, about 3m down from the surface, is a bed of peat mostly about a metre or so in thickness. 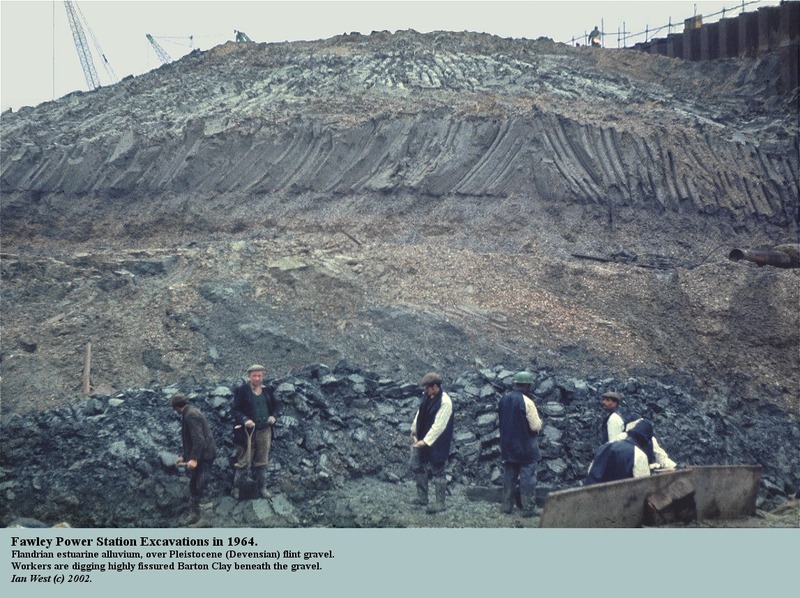 This was the main bed of peat in the Fawley Power Station excavations and there can be little doubt that if the supposed bodies were found in peat, then they had to come from this bed. Borehole records show that the peat is well developed at exactly the site from which the bodies have been reported. This peat is discussed in more detail below. 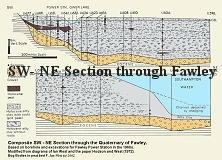 This is a cross-section of the Fawley Transmission Tunnel. Many boreholes were made on the line of the tunnel and this helped with my geological interpretation at the time of construction. The section is a fairly simple one with southwesterly dipping (low angle - 1-2 degrees) Bracklesham Group sands and clay. 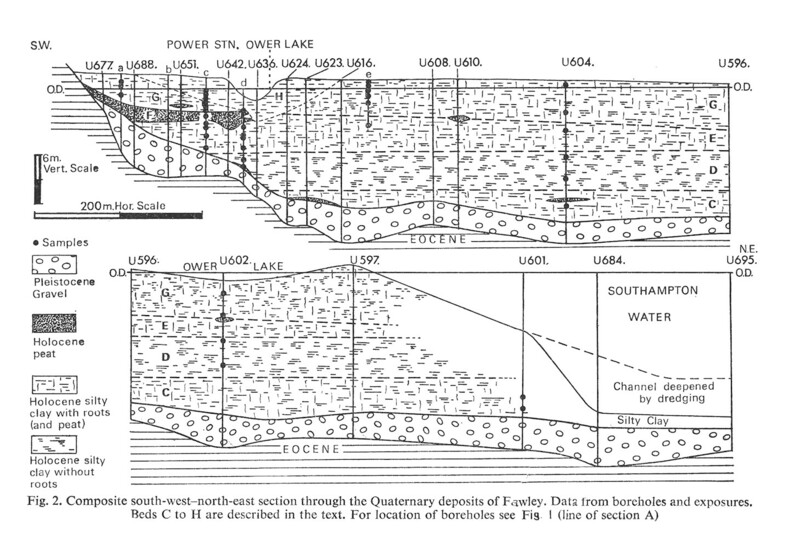 Although there is some Marsh Farm Formation at the Chilling end, the Selsey Sand Formation (Upper Lutetian or Auversian) is the dominant unit here. It contains very fossiliferous, green, glauconitic sand with abundant aragonitic bivalve and gastropod shells. The small nummulite - Nummulites variolarius is very abundant and is a good marker for this unit. Large septarian nodules occur in places and these were a problem for the miners. Excavation was largely by hand in a tunnel with 12 feet diameter iron rings (concrete rings were not found to be satisfactory in the difficult conditions). The miners, mostly Scottish, worked under an air pressure of 35 pounds per square inch, provided by the compressor machines at each end of the tunnel. It was necessary to keep the pressure this high because of the hazard of incoming water. Much air escaped and bubbled up to the surface. As a result, sulphuric acid and a high temperature were produced by the reaction of the oxygen with pyrite, an abundant constituent of the glauconitic sands. The high air pressure meant that decompression tanks were necessary and, even if injured, miners could not depart for hospital but had to be decompressed for about three quarters of an hour. The miners worked in a very energetic manner that seemed almost reckless. This was because they were on piece-work and wanted to make as much daily progress as possible. There were fatalities, one miner falling in the shaft, and another accident was said to have involved an incompletely closed, airlock door and the consequences of the high air pressure. Even brief geological work in the tunnel required a medical examination before permission was given to go underground. The miners did not welcome a geologist perhaps delaying their work and pushed on, with pausing. In addition some minor technical problems arose during construction of the tunnel. An enlarged joint (or possibly a fault due to neotectonics) was encountered near the middle, and this fissure was full of gravel from the Pleistocene Gravel bed above. As a consequence it allowed escape of air and much easy access for water. It was sealed with iron rings and cement and progress continued. Much fossiliferous debris from the Selsey Formation was dumped at the northeastern end of the tunnel near Chilling. Here Professor Denis Curry (owner of Curry's Stores) and myself collected molluscan fossils. Details are given in a paper by Curry, Hodson and West (1968). 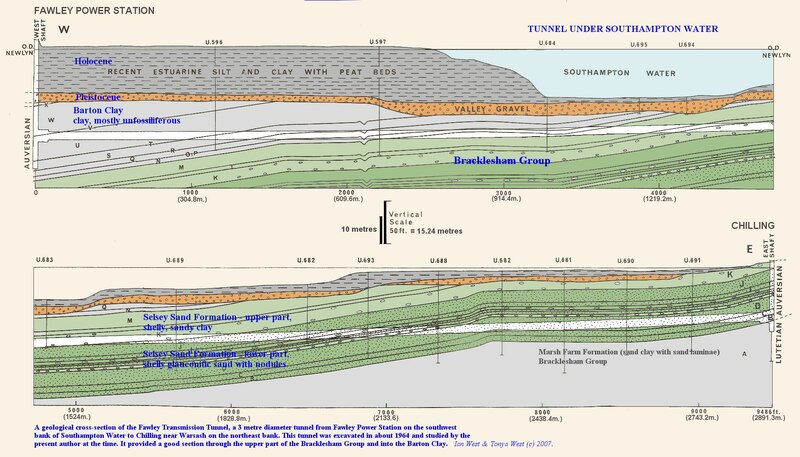 The outfall tunnel for the discharge of warm water from Fawley Power Station is entirely in Barton Group strata. Most of it is in the Barton Clay. This proved to be relatively homogeneous and disappointing in terms of fossil content. It was not richly fossiliferous as at the Barton Cliffs. From a civil engineering point of view it had an annoying characteristic, which also applied to clays encountered in the Transmission Tunnel. The Eocene clays are of fairly shallow origin and contain numerous sand linsen. These are small lenses of sand originally formed as sand ripples on a muddy sea floor. In the tunnels there were, of course under air pressure of up to 35 pounds per square inch. They were also under hydrostatic pressure and possibly overpressured. There would be pressurised water between the sand grains of the sand linsens. Thus when dug into in the tunnels they could to some extent burst out in the form of miniature explosions. 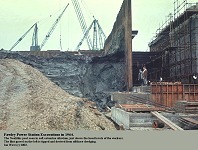 At the offshore outfall structure the rising tunnel pipe, excavated in about 1962, entered fossiliferous Chama Member. At this locality this consisted of bluish-grey, sandy clay with numerous flat oysters. The bivalve Chama was not found. Above the Chama Member the vertical shaft was in bluish-grey, argillaceous sand, not appreciably fossiliferous. After excavation the debris was deposited in this barge; there were doors beneath, allowing dumping of the debris onto the sea-floor (I think that the chains were part of the mechanism for this). 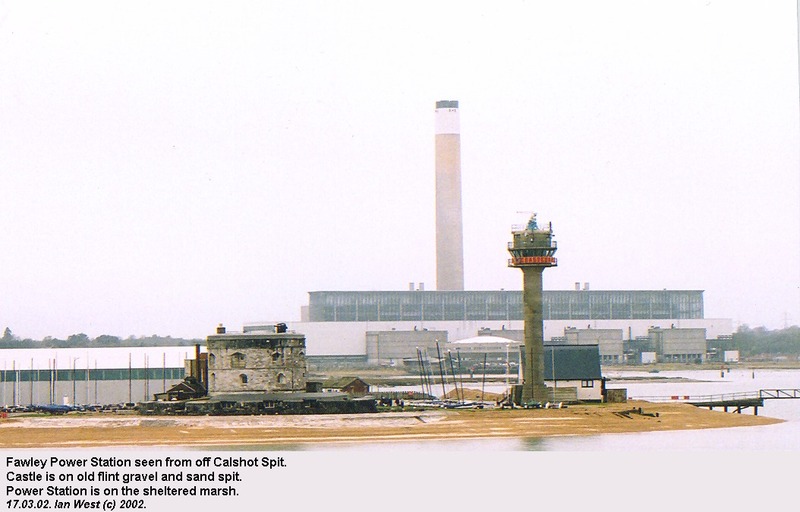 The completed outfall structure is clearly visible nowadays from Calshot Spit. The warm water from the Power Station is only discharged at certain times, though, from the outflow structure. This is because the oil-fired, power station is not in continuous use, but is held in reserve for times of high electricity demand (observe whether smoke is coming from the chimney). It has turbines which can be started up very quickly. 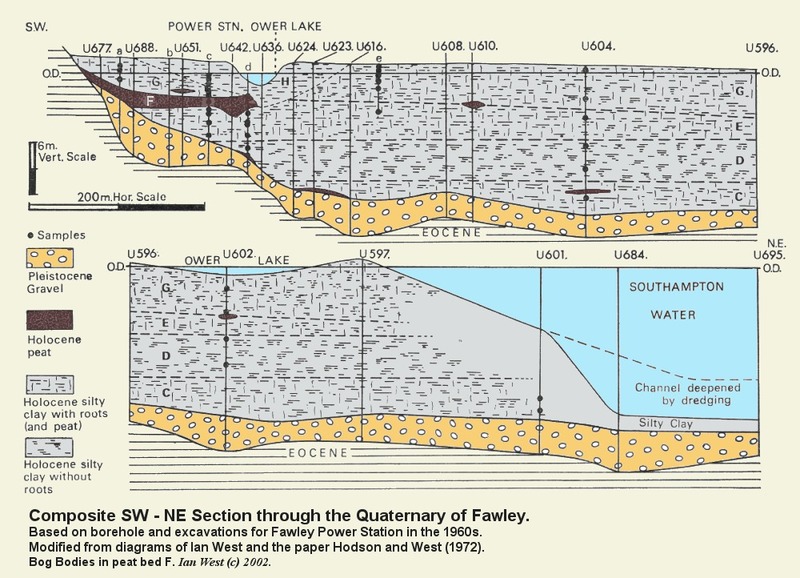 The following sections of this website provide information on the Quaternary sediments at and around the Power Station site at Fawley. Much data here is on the Neolithic peat, because there is a possibility that the bodies were found in this. 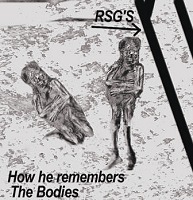 Details provided by Mr Dunn above, however, suggest that the bodies are from a deeper and older horizon. Information will be provided on an older peaty soil just above the Pleistocene gravel. This has tree remains and was likely to have been penetrated during the excavations. Consideration must also be given to the possible existence of Pleistocene deposits in or under the gravel. Such peat deposits occur nearby at Stone Point, near Lepe Beach, and here elephant remains have been found. There is no borehole data available at the moment to suggest that such Pleistocene peaty deposits occur at this site. The bed of Betula-Phragmites fen-wood peat at Fawley (Bed F) ranges in thickness from 0 to 3.35m. It is brownish-black and fibrous. 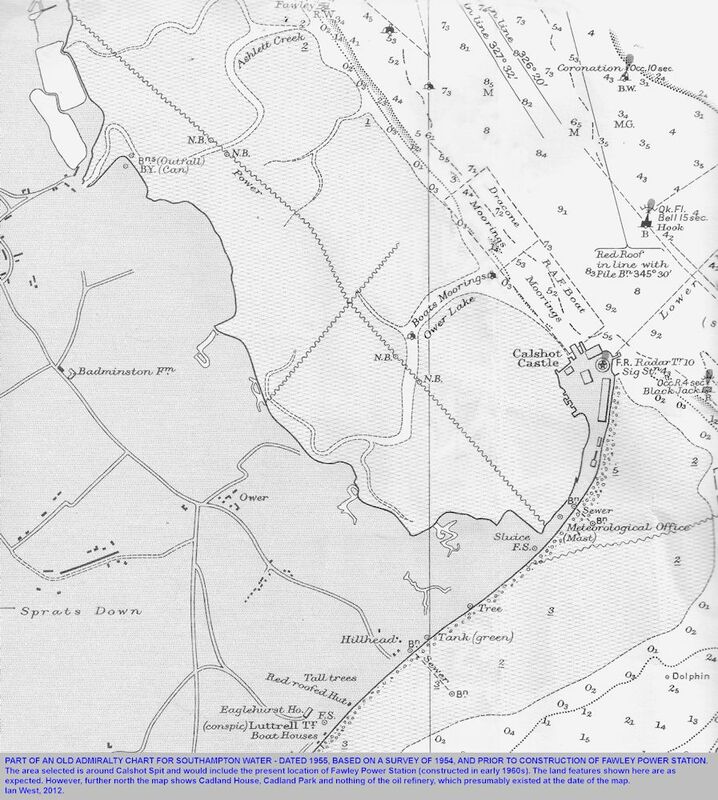 It was mapped by Ian West in the 1960s on the basis of borehole data (the map is shown here). The peat ends in a northeastward direction near Ower Lake. It seems to terminate quite abruptly just southwest of the main northwesterly-trending branch of that old estuarine creek. 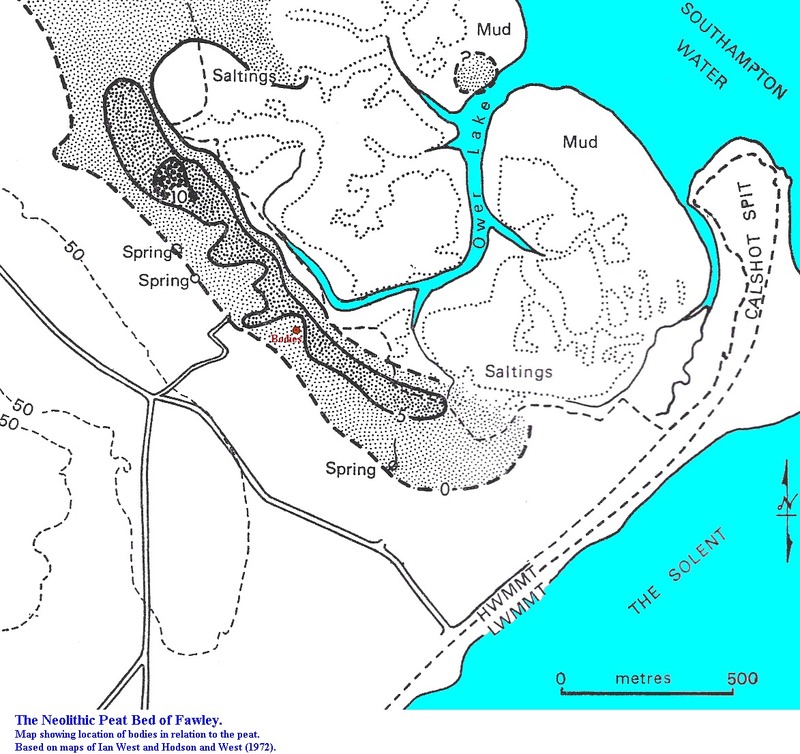 It is probable that the development of the peat was limited on the waterward side by the salt-water-bearing channel and an associated saline embayment. Landwards (southwest) the peat ends where the hillslope rises from the marshy borders of the estuary. This is the landward limit of the Holocene deposits and almost coincides with the junction of the Barton Sand and Barton Clay on the subdrift floor. This junction is a notable place for springs which provide freshwater (although it may be ferruginous). The uppermost part of the peat has been dated as 3689 B.P. and the base gave a similar date (Churchill in Godwin and Switzur, 1966). Hodson and West (1972) suggested that it belonged to zone VIIb, rather than VIIa as suggested by (Godwin and Switzur, 1966). Comparison - Peat at the Former Southampton Power Station. 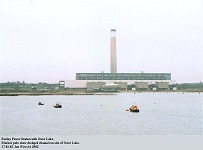 On reclaimed estuary east-southeast of Southampton railway station the former Southampton Power Station was built. The site has map reference SU 415121 and is at the junction of Western Esplanade and Civic Centre Road, at the corner (southwestern side). The Power Station has since been demolished and there has been new development here. The Southampton Geothermal Well is situated adjacent to the former site of the old building. 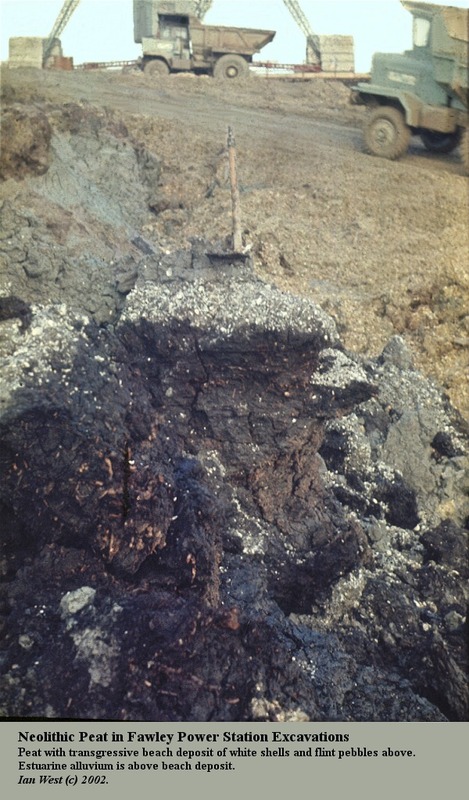 Thus the peat is of similar thickness to that at Fawley Power Station, but at shallower depth, in this case at about 1 to 1.5 m below OD. The peat died out towards the northeast, the former shoreline, and the Kingsfield Escarpment. A list of fauna is given by Hooley (1905), but this if from the estuarine alluvium and not directly from the peat, although some bones could have been reworked from it. The peat was regarded as Neolithic but no Neolithic remains were found in it. The peat bed has been reported in many places other than Fawley Power Station. It was encountered in the Esso Oil Refinery to the northwest, in the area of two giant oil tanks close to the major oil refinery jetty (Barton and Roche, 1984). Two giant oil tanks failed and were repositioned nearby. 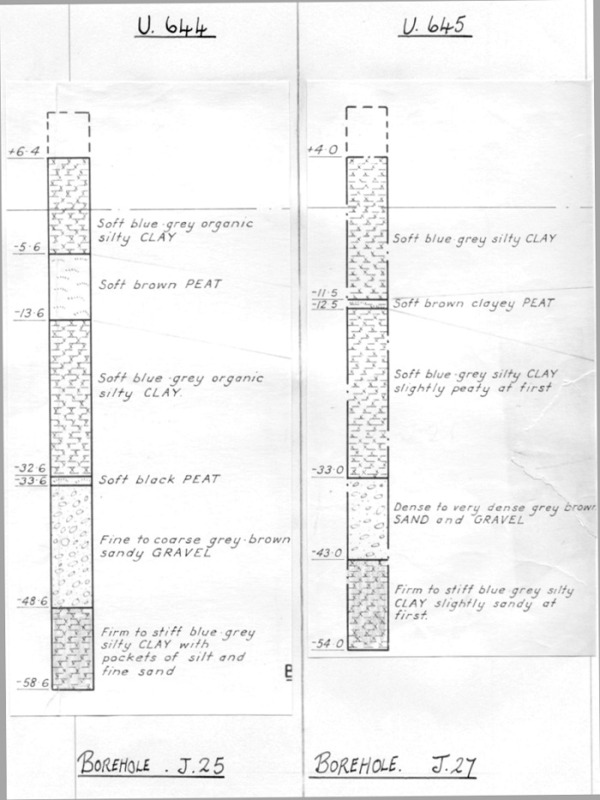 Beneath the original tank site 281 silty clay, 1.9m to 4.9m in thickness was found to overlie peat of 0.9 to 2.7m in thickness. Beneath this was silty clay and silty sand. 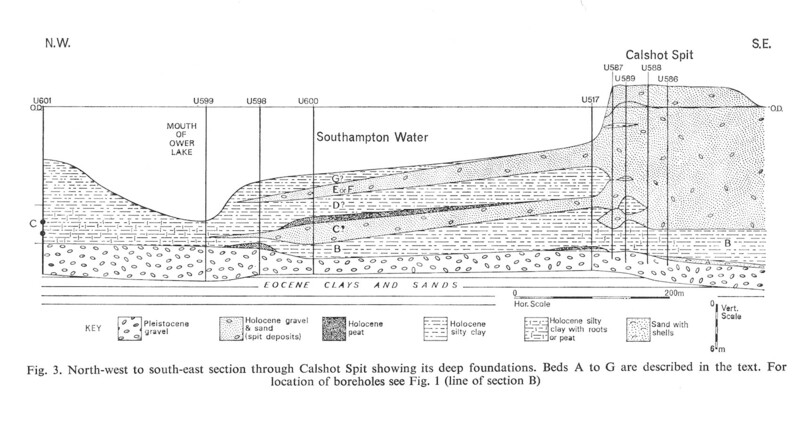 Barton and Roche (1984) provided cross-sections showing only one bed of peat to be present and as at Fawley Power Station extending water-wards from the former shoreline and Pleistocene gravel out into the estuarine mud. It confirms that the Fawley section is representative of the Holocene (Flandrian) deposits of the southeastern side of Southampton Water. The peat here is described as black and dark fibrous peat with decayed wood fragments, shells and traces of grey silty clay. 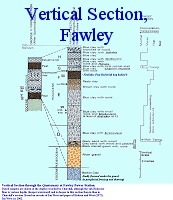 The thickness and distribution of the peat bed beneath Tank Site 281 and westward suggests that it could be the same bed as the thickest and best-developed peat layer at Fawley Power Station. This is Bed F of Hodson and West (1972), which as noted above was dated to about 3600 BP (Godwin and Switzur, 1966). 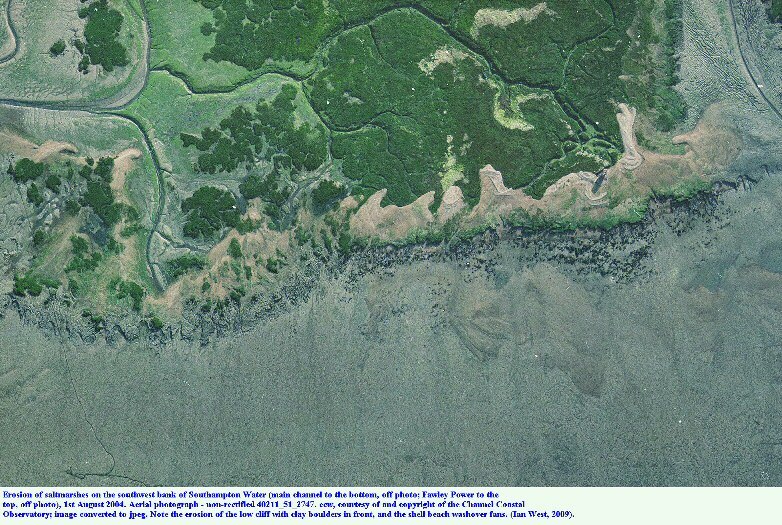 The thickness and extent of this bed shows a notable period of growth in saltmarsh and fen (Barton and Roche, 1984). These authors noted that in considering the development of peat beds in estuaries Oakley (1943), Churchill (1965), Heyworth and Kidson (1982), and Hawkins (1984), amongst others have discussed the problem of whether this represents a seaward regression of sea level or whether it indicates a change in conditions such as the build up of a barrier enabling plants to grow at sea-level or below. 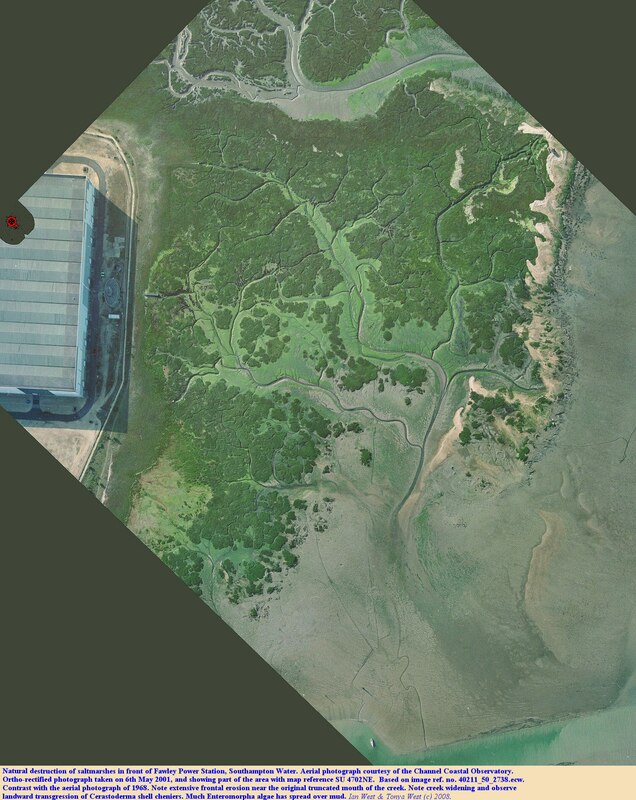 The peat bed at Fawley Refinery gradually thins eastward with no sign of a barrier. 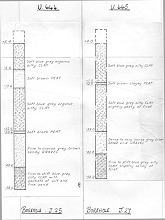 Barton and Roche, (1984) found the peat developed on what appears to be a Flandrian beach and concluded that the peat represents a slight regression of sea-level or at least a still-stand as suggested by Devoy (1982). 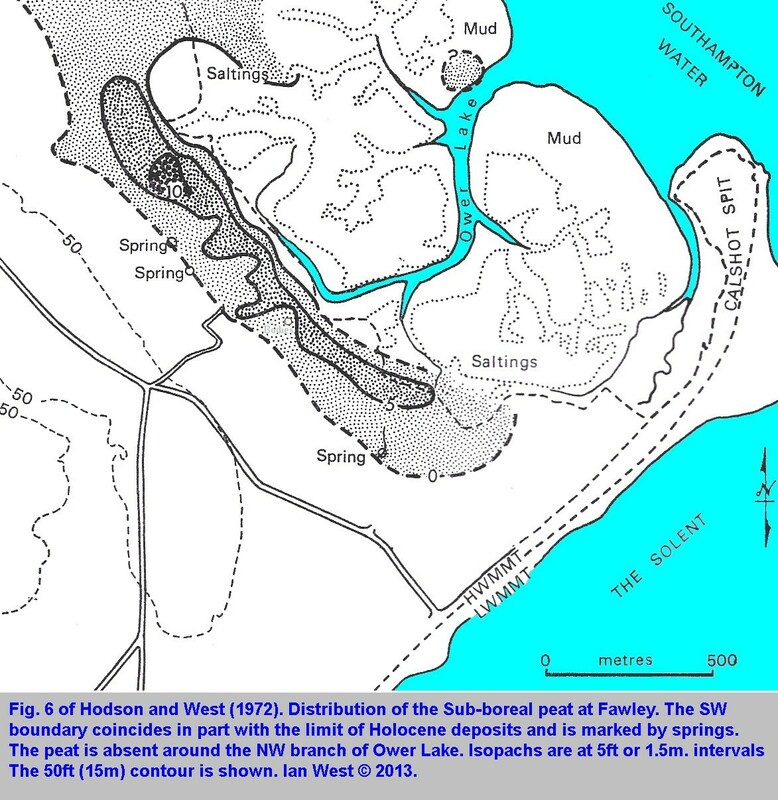 This accords with the peat at Fawley Power Station indicating this sea-level effect between about 4500 BP and 3000 BP. During excavations for the Empress Dock (adjacent to Southampton Oceanography Centre) the evidence for Neolithic work in situ has been found. Stone implements with flint flakes were found lying together (Shore, 1905). A bone bodkin for sewing skins has also been found there. A smooth stone hammer head of circular shape had a hole drilled through the middle by some type of early hand drill. These borehole records show that the normal feature in this area is a thick bed of peat at about 3 m (10 feet) depth. This is the Neolithic or Sub-Boreal peat. Only reported rarely, as shown in borehole U644 is there another peat, a thin one of about 1 feet, just on top of the Pleistocene gravel. This lower peat may also occur as occasional thin lenses in the alluvium further out towards the central channel. This peat bed is not well-developed at the excavations but there may widespread occurrence of a thin Flandrian soil on top of the Pleistocene gravel. Wood remains have been found in another part of the Solent estuarine system off Hayling Island. Timber there has been carbon dated at more than 6000 year BP. With it is a blackened timber that has been worked by humans, but its age is not known and it might be of much later origin. The origin of this piece of wood with holes drilled in it is still a mystery. 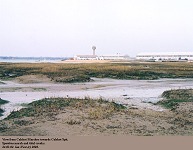 Other peat and submerged forest deposits occur at Portsmouth Docks, near Lepe Beach, at Lymington, at Bournemouth and on and offshore from the Isle of Wight. An account was received from the late Mr Dunn (of Shakespeare Avenue, Totton), a former worker on the excavations for Fawley Power Station in 1965 about the supposed discovery of bodies in peat here at that time. It is sad to record that he died in February 2006. 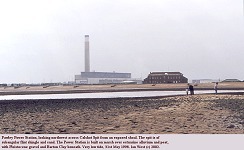 The photographs show, left, the Power Station in 2002, centre the adjacent salt marshes in 2002, and right, the excavations in 1964, of the type on which Mr Dunn worked. What were found by the workers in a coffer dam at the southwestern end of the Power Station site and near the inlet or creek of Ower Lake was said to be two peculiar bodies of small stature. As a result of hearing this report, Alan Murray has collated all evidence he can find relating to this. He has enquired widely but so far, without success, as to the whereabouts of the supposed bodies. When he sent an enquiry to Dr Ian West at Southampton University it was confirmed that the setting and details of the site given in the account agreed with was independently investigated by Ian West at about that time. He co-authored two papers on the deposits here: Curry, Hodson and West (1968) and Hodson and West (1972), and a later review paper (West, 1980). There is indeed a peat bed present and it is of an age comparable to peat beds elsewhere in the region that contain evidence of human activity. Diagrams, and details are given below. The peat bed is Neolithic and the possibility that these were "bog bodies" is quite feasible. However no remains of the "bodies" have been found, no records of these preservation or burial seem to exist, and no photographs have been encountered and so therefore there is no independent evidence. As a result we cannot confirm that these really were human remains and nothing is proven. The account of Mr Dunn is quite detailed though and correct in various technicalities. 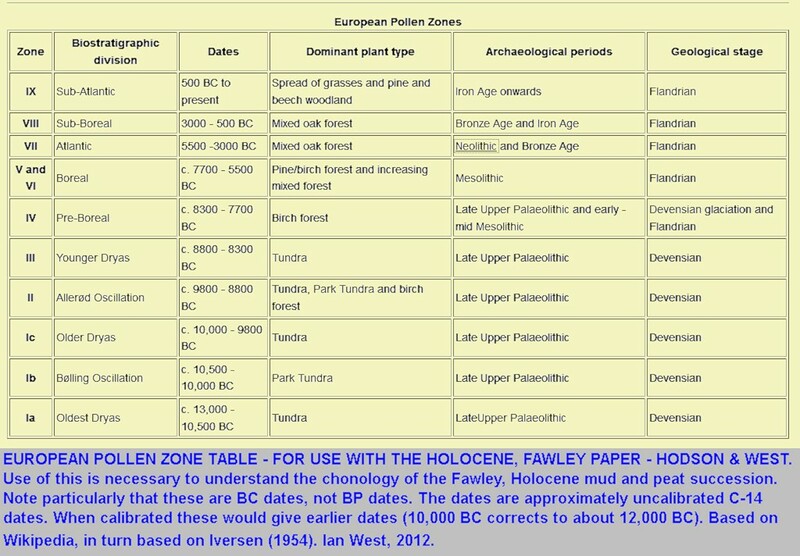 It seems appropriate to provide information on the supposed discovery and on the Flandrian (Holocene) clays and peats of this site. Even if nothing is established it may encourage careful search in any future excavations of equivalent peat. 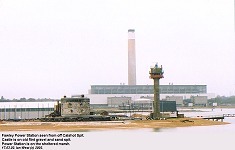 The bed of peat at Fawley Power Station was about 3m below Ordnance Datum and noted that it had already been dated by Churchill (1966) as about 3689 BP and 3563 BP (before the present, based on carbon-dating). The peat bed is a Betula-Phragmites (birch-reed) fen-wood peat ranging in thickness from 0 to 3.35m . Boreholes show that it terminates rather abruptly, just west of the creek Ower Lake, and its former north-westward extension. It is probable that the peat was limited on the waterward side by a predecessor of this salt-water bearing channel. Landwards the peat ends where the hillslope rised from the marshy border of the estuary. This is also the landward limit of the Holocene deposits and almost coincides with the junction of the Barton Clay and Barton Sand on the sub-drift floor. Here springs supply freshwater. This major and upper bed of peat is of Neolithic age and corresponds approximately to the peat at the Eastern Docks, Southampton which contains the ox, Bos primigenius, reindeer and Neolithic implements (Shore and Elwes, 1889). 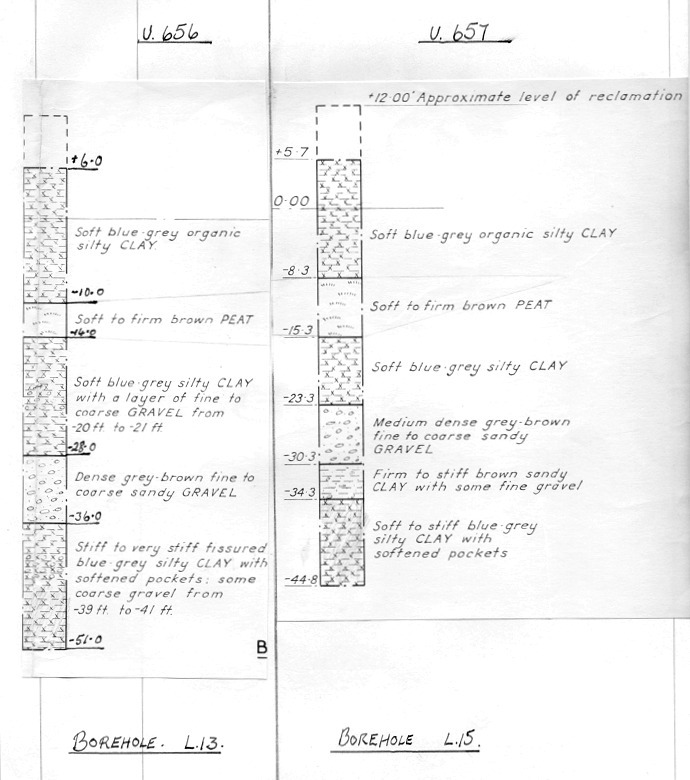 The location information given by Mr Dunn is for a position where this peat is present, and there are borehole records at Southampton University to confirm this. We are sure, therefore, that was peat there. Mr Dunn thought that the peat in which the supposed remains were found was much older. The excavations for the foundations, however, did not penetrate an older peat (although one was encountered in boreholes). The depths given by Mr Dunn also seem too great, and his account seems to point to a lower peat bed but this could not have been reached in the foundations, only in the tunnel excavations. The lower peat one is really peaty sand with wood and is effectively an old soil and forest resting on the top of the Pleistocene gravel. It is shown in a cross-section below. In terms of date this would be more than 6000 years BP. 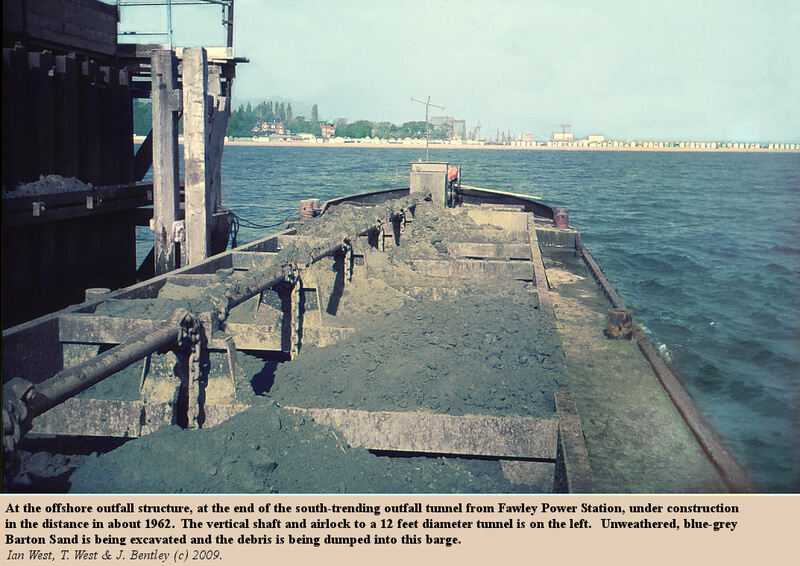 Mr Dunn worked on the Shafts being tunnelled at Cadlands (Fawley) in approximately 1965. While working on the coffer dam, they excavated through the different layers, there were two peat layers or beaches as he calls them. 0ne was at approximately 21 feet (6.4m) down but the one with the two bodies was about 75 feet (22.9m) down. [A depth of 75 feet is abnormally deep for the Flandrian (Holocene) deposits of this area. 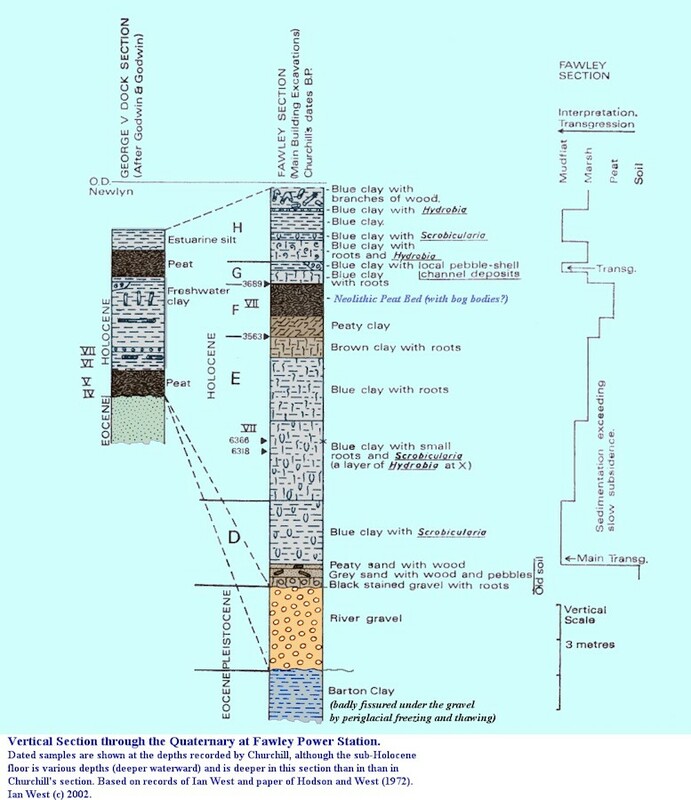 Such thicknesses of clays and peats do not occur at the Power Station and these depths would give positions in the Eocene clays. ] Mr Dunn said that the bodies were found on the edge of the coffer dam. The bodies were quite small; he thinks that they were about 4 feet (1.2m) long. They looked to him like 'alien' figures. The workers were told at the time that the layer they were working on was about 30,000 years old [but this date is too old for peat at this locality]. In the peat layer where the bodies were found there were quite a lot of tree trunks some of which seemed to have been burnt (although this is not confirmed and it might have been just carbonised timber). Photographs of the bodies were taken at the time and they included some of the work force; the workers never received copies. The employees stopped work and some people in white coats, whom he thought came from Southampton University, took away the bodies. Later he asked the foreman what had happened to the bodies and he was told there were no bodies. They had just been tree trunks. After a few days had gone by he contacted the Echo (newspaper) Office and Fawley church and he spoke to the Grave Digger, to see if the bodies had been reburied. Once again no-one had any knowledge of the supposed bodies. Mr Dunn made further enquiries but was never able to find out where they went or anything further about them. He remembers that as they were building the coffer dam, and because they were behind schedule they were told only to tack-weld the RSJ�s in position to save time. As they went down past the first peat layer there was some ground movement and the piled sheeting began to move. They then had to backfill and start again it was after they went down past the layer they had been working on , that they found the bodies. By then they were well behind schedule and he believes this is the reason the bodies were removed so speedily. 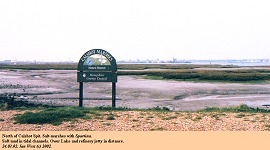 Mr Dunn remembers that a Miss Barnett (known to Clare Murley of Fawley Historians) who lived locally came to say a prayer over the spot at which the bodies where found." 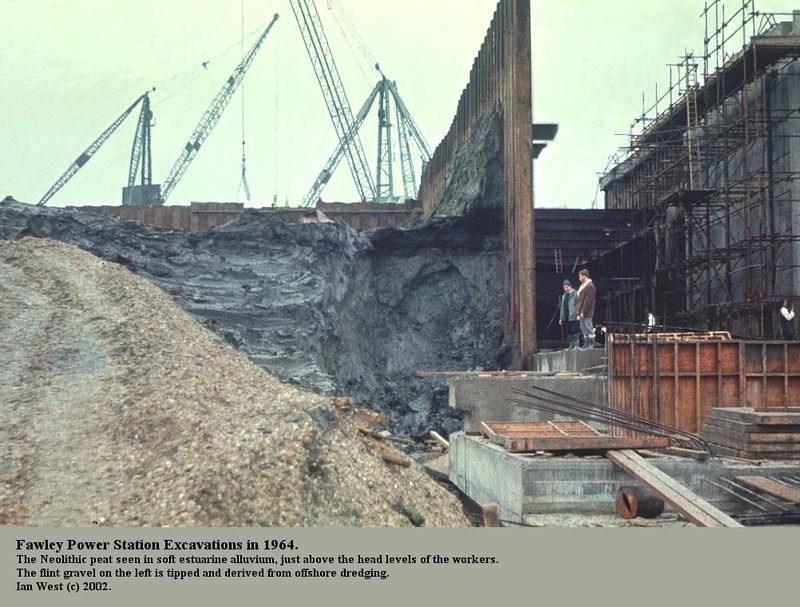 There seems to be no proof but the possibility remains that ancient human bodies might have been found in 1965 in peat in the excavations for Fawley Power Station. Such a find would be compatible with the known succession of strata at the site, particularly the occurrence of a Neolithic peat bed. This was one of the largest excavations of Neolithic peat in the region, which increases the chance of discovery. The strongly reducing conditions in the sediments (all very organic-rich and below sea-level) would be appropriate for preservation of remains of bog-body type remain, such as occur in Quaternary peats elsewhere. However, no independent confirmation at all has been received. If remains really were found then they are now almost certainly lost or destroyed. At a later date (January 2003) the following comments were received from a former engineering assistant at the site. " I read with great interest about the bodies supposedly found while excavations were being carried out. As a 16 year old I went to work at Fawley as a chainboy assisting the engineers taking levels/theodilite readings and in the four years I was there I heard of no such findings. If there had been something found we would have heard something unless it was kept quiet for fear of media/archaeology interest which may have hampered work progress. I later worked for the consulting engineers testing the concrete being laid and in all my coverage of the entire site heard of no such findings." A few years ago, another correspondent, a pathologist, commented that the former existence of the bodies was unproven and therefore the story was a myth. However, he added that if ancient bodies were found on a building site, it was not entirely unknown for removal of such objects to take place so as to avoid hindering the progress of construction. The Southern Daily Echo has recently revived interest in the topic with an article by Sally Churchward (2006). Helpfully, this article asks people to respond with any useful information. Perhaps the Echo will find out more about the story! For some further information regarding bog bodies, see the webpage on: Iron Age 'bog bodies' unveiled, BBC News, 7 January 2006. Radiocarbon dating, for example, would show that both had died at similar times - around 2,300 years ago. .. One of the experts is Don Brothwell, the York University archaeologist who led the scientific investigation of Lindow Man, the bog body found in Cheshire in 1984. Hundreds of bodies have been recovered from peat wetlands across Northern Europe. The earliest accounts date back to the 18th Century. The unique chemistry of peat bogs essentially mummifies bodies. ..The peat-building sphagnum moss embeds remains in cold, acid and oxygen-free conditions that immobilise bacteria. 'The way peat wetlands preserve bodies has been described as a process of 'slow-cooking' which tans them dark brown,' Timewatch producer John Hayes-Fisher told the BBC News website. Solent Forum. This site provides information on the work of the Solent Forum and its member organisations. 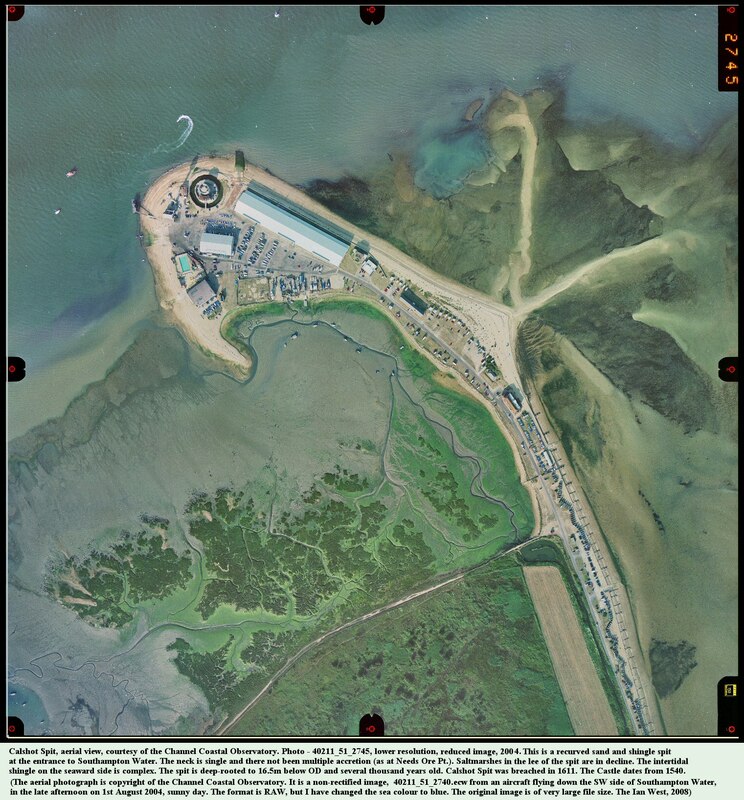 The Forum is a regional coastal body that was established in 1992, to improve the management of the Solent and its coastline. The Solent lies on the south coast of the UK. The Hampshire and Wight Trust for Maritime Archaeology. 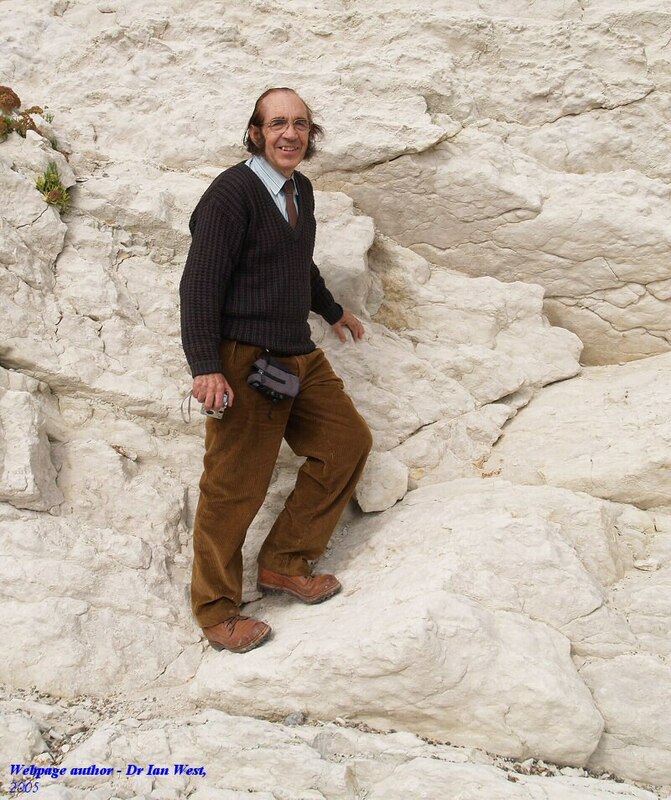 Most geological references are in the Solent Bibliography, and links are provided in the text. 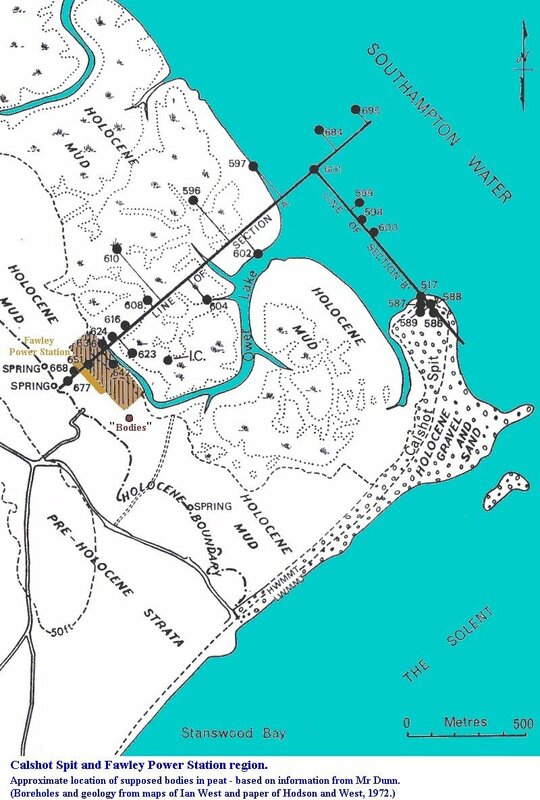 Some additional ones, not specifically on the Solent may be placed here, together with some selected archaeological literature that might be relevant. It is one of Hampshire's great mysteries. It has it all - strange alien-looking bodies, mysterious people in white coats, a possible cover-up and a lot of unanswered questions. It could have come straight out of The X-Files. More than 40 years later the truth about the Fawley bog bodies is still not known. 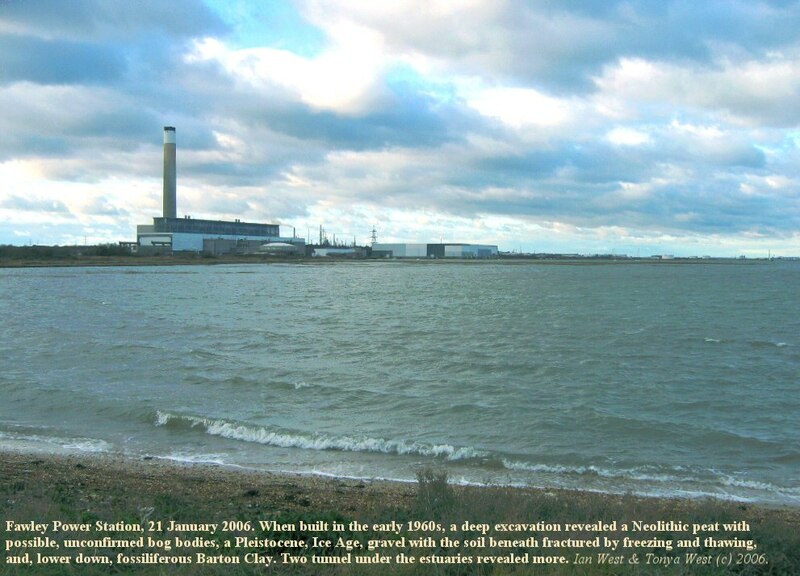 Unconfirmed stories have been circulating in the Hampshire archaeological community and in pubs for decades about two alien-like bodies that were supposedly found by men excavating at Fawley power station. The actual facts of about what really happened are as sketchy as they are tantalising. Reportedly a man called Dennis "Dicky" Dunn from Shakespeare Avenue, Totton, was working on shafts being tunnelled at Fawley in about 1965. Having dug down about 75 feet they came to a layer of peat. Here they were shocked to discover what appeared to be two small bodies, about four feet long, of alien-like appearance. Work was stopped and some people in white coats came and removed the bodies - and they were never heard of again. Later on Mr Dunn asked the foreman what had happened to the bodies and was told that no bodies had been found - they had just been tree trunks. He then contacted the Daily Echo to see if anyone there had heard anything and spoke to the gravedigger at Fawley Church to see whether bodies had been reburied but no one knew anything. Sadly Mr Dunn died in February but his wife Doreen still vividly remembers when he came home from work and told her what he had seen. "He said there were some fingers from the bodies that had broken off and he wished he'd kept them," she said. "He was always convinced that he'd seen the bodies. At the time lots of the men he worked with used to come to our house and they were all talking about seeing the bodies." There were lots of Irish workers in Mr Dunn's team and he and his wife suspected that the bodies may have been taken to Ireland where they were subsequently "discovered". Mr Dunn's story lives on thanks to his former neighbour Alan Murray. Mr Dunn was sure that he had seen the bodies and asked his neighbour, who had a computer, to have a look on the Internet to see if he could find anyone else who knew anything. They didn't find anything so eventually Mr Murray posted the story on a website, but this has provoked more questions than answers. Did the bodies really exist? If so, were they the ancient remains of people from the Neolithic era or did they come from elsewhere? Who were the people in white coats who took them away? Were they; as Mr Dunn believed, scientists from the University of Southampton or did they come from elsewhere? What happened to them after they were taken away? And why has no one else come forward to say they saw something similar? Graham Parkes, chairman of Waterside Heritage and a keen amateur archaeologist, believes the rumours about the bog bodies are nothing more than a local urban myth. "There are different interpretations about what was found," he said. "One version is that two blackened tree stumps were found by the contractors which were interpreted as bodies by a third party who apparently only saw them from a distance. "But if they had been bodies they would have to have been reported to the police, which they weren't." "The people doing the work said they came across a layer of peat and within it they found some misshapen pieces of wood. "As there isn't any real evidence to support any other theory; you have to veer towards it being wood." "If there had been bodies they would have been in peat on top of a layer of clay or soil." "Apparently they had to dig through a lot of different layers before they hit the peat which would, have put what they found rather far back in geological history for it to have contained any bodies." "There is no evidence that they were bodies but it's become an urban myth." Local archaeology and history groups including Southampton Archaeology; Fawley Historians and the County Archaeologist for Hampshire have heard the rumours and had enquiries over the years about the story behind the "bodies" but they have no hard facts about the matter. 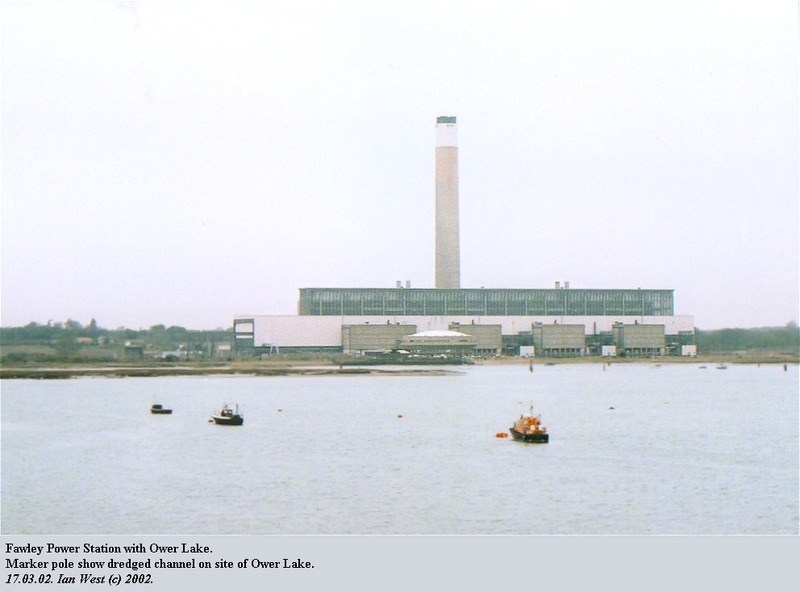 Dr Ian West from the National Oceanography Centre at the University of Southampton has posted Mr Dunn's story on his [Fawley Power Station] website. 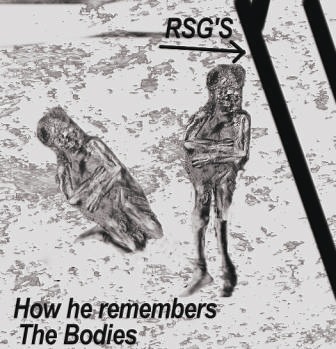 The story was written up by neighbour, Mr Murray; who also included sketches of the bodies based on Mr Dunn's recollections. 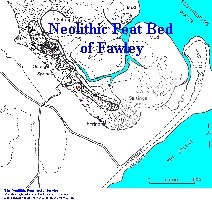 The website includes a section on the geology of Fawley and Dr West says that from a geological perspective it is possible that Neolithic bodies could have been at the site. "Geologically it is quite possible in that the bodies were supposed to be found in Neolithic peat which is under a lot of Southampton," said Dr West. He had hoped that giving publicity to the story would help get to the bottom of it but no fresh information has come to light. So what is the truth behind the bog bodies of Fawley? Was there really a conspiracy that covered up a find of human remains? Or was it just a case of someone with a vivid imagination misinterpreting what they saw? Copley , G.J. 1958. An Archaeology of South-East England. A Study in Continuity. Pheonix House Ltd., London, 324 pp. Cunliffe , B. 1978. Hengistbury Head. Elek Books Ltd. 54-58 Caledonian Road, London, N1 9RN. ISBN 0 236 40125 4 (cased), 0 236 40107 6 (paperback). 95 pp. London. Printed by the Camelot Press, Southampton. By Professor Barry Cunliffe, Professor of European Archaeology, University of Oxford. Contents: 1. The site and its early exploitation. 2. Trading port and oppidium: the archaeological evidence. 3. Hengistbury as a port of trade. Appendix A. The present location of the archaeological material. Appendix B. The Hengistbury barrows. Appendix C. Iron Age coins from Hengistbury. Bibliography. Index. Dente , J. Fascinating Story of Bogs: Their Role in Preservation. Irish Peatland Conservation Council. Registered Charity Number CHY6829, Copyright. Extract: "Out of the hundreds of bog bodies that have been found throughout history, few remain to be studied today; either no legitimate record was made at the time of their discovery or there is a scientific account of the find but the body itself has long been lost or destroyed. One way to ensure that future scientists won't run into these same problems is to follow a strict scientific procedure for excavating, dating and conducting preliminary examinations, and then to conserve the body the most effective way possible". Glob , P.V. 1965. The Bog People: Iron-Age Man Preserved. Translated from the Danish by Rupert Bruce-Mitford, Keeper of British and Medieval Antiquities in the British Museum. Faber and Faber, London, 200 pp. Lloyd , A.T. 1975. Place Names and Personalities. Chapter 5 In: Small, D. (Editor) 1975. Explore the New Forest. Her Majesty's Stationery Office. Turner , R. C.; Scaife R. G. 1995. Bog Bodies: New Discoveries and New Perspectives. British Museum Press: London. The 12 papers in this are listed by Jenny Dente in Bibliography on Bog Bodies. Several people assisted in terms of access and of providing borehole data, many years ago. This was much appreciated. The late Professor Frank Hodson kindly supported this work, which was initiated after discussion with the British Geological Survey. Field work and data assembly was by Ian West. More recently, I am particularly grateful to Alan Murray and Dicky Dunn for bringing up the matter of the supposed bog-bodies and providing so much helpful information. I am very grateful to Alex Scott for independent information on the site, and to all others who have tried to help with enquiries.